The first days of the New Year in Moscow witnessed some changes, many pleasant, and some alarming. Hiked parking prices in the city centre can be considered one of the pleasant changes in Moscow. This is a forced measure, as the number of cars in the Russian capital has increased more than four times over the last two decades to 4 million. In fact, Moscow's population of 12 million is larger on working days, as many employees resident outside the city commute to Moscow for work. Moscow traffic jams became commonplace a long time ago, so the city administration resolved to take an unpopular measure, that is to increase the price of parking to 80 roubles (around $2.40) an hour. The parliamentary opposition party, A Just Russia, is planning to launch a petition for a referendum on the issue. Yet faster traffic in the centre is visible to the naked eye. To compensate for costlier parking the mayor’s office has been taking measures to improve public transport. Some busy Moscow roads now have special lanes for buses and trolleybuses. Car drivers entering this lane will face a fine of 3,000 roubles (about $100). This year, 9 new stations will join the existing 190 stations of the Moscow metro, which transports 6.4 million passengers daily. The administration is planning 64 more stations to be constructed by 2020. The double-track mileage of the subway’s 12 lines will increase by 137 kilometres from the current 317 kilometres. In addition, in 2014 Wi-Fi will become available on all subway lines. The New Year also promises completion of huge transport projects — reconstruction of several motorways and the commissioning of a federal motorway to the Sheremetyevo international airport. Moreover, the authorities pledge special ‘smart’ traffic lights. The united control centre is to change the operating modes depending on the road situation, which is expected to provide a more effective flow of traffic and reduce traffic jams. 2014 will also see new high-speed trams running up to 80 kilometres an hour, seven times faster than usual trams, mini-trains of five coaches with a walk-through. Changes for the better are pleasant. Yet the prices disappoint. From January 1, one- and two-trip tickets for the metro went up 33.3 percent to 40 and 80 roubles ($1.20 and $2.40), the same tickets for riding surface public transport rose to 30 and 60 roubles respectively. From November 1, Moscow residents will face an increase of public utilities tariffs by about 7 percent. Many explain the hike was delayed till autumn ahead of the election of the Moscow legislature — those in power obviously do not want to risk facing public anger. Yet Mayor Sergey Sobyanin has described the looming growth as “an all-time minimum”. Demolition of old five-story buildings built back in the early 1960s, Khrushchevkas, will continue this year. This word was derived from the name of a former Soviet leader, Nikita Khrushchev, who introduced fast pre-fabricated house-building technologies following WWII. About 3 million square metres of newly-built housing is to take their place. 2014 may break records in terms of newly commissioned selling spaces. 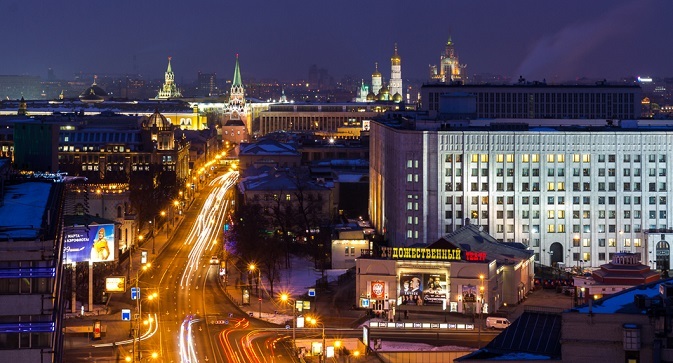 By experts’ estimates, Moscow will see the emergence of over 500,000 square metres of new retail trade facilities, which is 11 percent more than in 2013. Besides, over 1.3 million square metres of offices are scheduled to be built, which indicates 40 percent year-on-year growth. Moscow is being constructed and expanded, and it is getting more beautiful. One should not miss a winter stroll along the old Tverskaya Boulevard, the location of the Itar-Tass office. Its refurbishment was completed in late-2013. The boulevard now boasts of new paths and benches. Trees decorated with LED garlands are enticing admirers from the suburbs in the evening, who are wondering if they have all of a sudden found themselves in Paris or London.